The above info came from mandy, and was edited by yours truly (contact me). The image came from musogato.com. Appa is Aang's first pet and his main source of transportation. This flying bison really loves to eat and he often sneezes all over Sokka, which grosses him out. 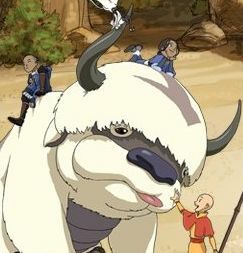 According to Aang, Appa has five stomachs (does that make him part cow?). What kind of creature he is, is a mystery. 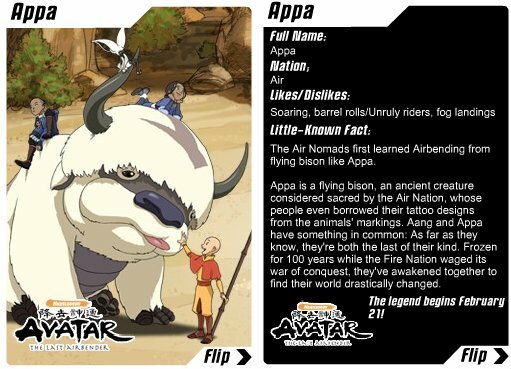 According to the creators of Avatar: The Last Airbender, Appa is part beaver and part bison (or buffalo). Appa loves to takes baths as much as he loves to eat. He's often seen hiding with Momo or sleeping when carrying Aang and friends to their next destination. The above description came from mandy, and was edited by yours truly (contact me).